"OH WHERE, OH WHERE HAS MY LITTLE BLOG GONE?....." It is so frustrating not to get the time to write. I started another post back on Thanksgiving and now too much time has past and I just abandoned it. So here I am again, trying to get another post written and published. Wish me luck! Everyone who skis has done it: the up and back. Better defined, this is the painful and slightly insane pursuit of attempting to drive to the mountains before the sun rises, ski all day, and then drag your exhausted backside home all in one day. In college we did this on occasion, but then I lived in Berkeley, which was one hour closer to the mountains, and I was a whole heck of a lot younger. I hadn't done an up and back in at least 16 years. But this is how it all came down. 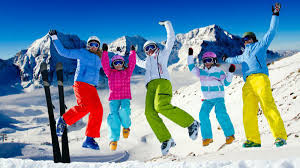 As mentioned before, we told the kids that, as we were going to Disney World in February, there would be no skiing this year. Then the rain started to fall in the Bay Area, which produced plenty of snow in the mountains. After hearing the Christmas week reports of glorious days on the slopes from our friends, Craig and I became wistful and decided we need to find some way to get up for a weekend. OK, ..which weekend did you have in mind? We hoped to find an open Saturday, but none came up. My daughter's rehearsals for the upcoming school play prevented us from skiing any Saturdays. We were forced to ski on Sunday. Really though, as skiing is so expensive, and expense was the whole reason we weren't going to go in the first place, we really planned to ski only one day. We decided we were going to do it, we were going to brave the up and back. If you are going to brave the up and back, of course it is best to ski in the resort that is closest and easiest to get to. I spent some time researching and found that Sugar Bowl, Sierra-at-Tahoe, Kirkwood, Bear Valley, and Dodge Ridge all were going to take about the same amount of time to get to. As we wanted something new and a mountain a little more challenging than previously skied, we decided on Kirkwood Mountain Resort, which is located in Markleeville along State route 88, about 3 hours and 40 minutes from our San Jose home. quiet. The staff was polite, the wifi and parking were free, and continental breakfast (which we didn't touch) was provided. The extra hours of sleep, plus the shortening of the morning drive and the elimination of the need to get out of our house in the morning, was well worth the money we spent on the room. You can buy your lift tickets online in advance and save a fair amount of money. This in no way means that the tickets are not still expensive. We saved $10 each on our adult tickets (making them $89 each), $9 on the Teen tickets (making them $80 each), and $7 on the child ticket (making it $65). This we did Saturday afternoon, and picked them up easily at a ticket window Sunday morning. By buying our tickets online, my GoFamily saved $45. It is also possible to rent equipment online in advance at a savings of about 20%. This also saves time as you fill out all your information about your skill level, height, weight, etc. ahead of time. Once again let me state that this in no means makes renting at the ski resort cheap. Recommended for our experience were the performance skis, which ran 52$ each. These were only 4$ more than the "sport" rental package, so we decided to go for it. By buying our rentals online, my GoFamily saved $65. Granted, we got there early so there wasn't much of a crowd, but we found the rental pick up process to be quite pleasant. I walked right up to a greeter who quickly looked up my paperwork and got us moving. The area was well staffed with polite and helpful young men and women from all parts of the globe. They helped get your boots on if you needed help and offered to store your shoes for the day. Are you my valet? They quickly matched us with skis and poles and off we went. All they had to do to get you checked in at the end of the day is scan a barcode on your boots and you were done. We also saved a considerable amount of money packing our own lunch, likely about 50$. However, there is no indoor area, at least in Kirkwood Mountain Village, which would appear to be the main base area, for picnickers. Both at Dodge Ridge and at Mt. Bachelor we could easily find a table indoors to eat our sandwiches and get a little warm. This particular day was a cold one, about 30 degrees, and it was mighty tough to eat outside. Please let us eat inside in your warm lodge!! We were on the fifth chair up the mountain at precisely 9am and rode the last chair up at 5 minutes to four. In the hours between, we made a very strong effort to see all aspects of the mountain. It was very difficult to find anything to complain about since it was skiing in the best of possible conditions-very fresh snow, and a lot of it, on a very cold day. The lifts that go to the very top of the mountain. "The Wall" and "Cornice Express" service a lot of very advanced terrain, and neither really offers an "easiest way down," but the runs are long, wide, and challenging, which is what many advanced skiers crave. There is also a quad chair servicing the backside of the mountain, which offers about half blue and half black runs, also quite long. On the front side of the mountain there are some lovely intermediate runs, but they are short. If you are an intermediate skier, it is difficult to get that top to base run experience at Kirkwood. A few other little quibbles-the signage is terrible..very small signs pointing to lift numbers rather than names. I generally like to know the names of the runs, so I can check them of my list, but there are no signs telling you what they are. Plenty of snow on the backside! This sign does not scare my children! MORE COMPLAINING: Kirkwood does not have enough lockers or enough parking. Also the bathrooms aren't labelled on the trail map. Another big problem is that there is only one road in and out of Kirkwood, which ends with about half the cars leaving making a left turn onto busy state route 88. This backs up the traffic terribly, making a quick exit impossible. We got into our car at 4:32, and then spent 22 agonizing minutes covering the 1.3 miles down Kirkwood Meadows Road to get out of there. UGH! OK, did doing an up and back kill me? No it did not, but in a heartbeat I would again spend the money to break up the trip in an inexpensive motel on the way up. Did we save a lot of money by doing an "up and back?" Well, yes, but let me inform you, skiing is in no way an inexpensive venture. All told ONE DAY OF SKIING for the five of us cost nearly $800 dollars, $400 for the tickets, $250 for the rentals, $100 for the room,and another $50 in incidentals. Remember we have already saved $110 by purchasing online. The only additional money we could have saved would have been by not staying in the hotel, and I already said that that money had been well spent. How would I do it the next time? Well, while a beautiful mountain, I would not go to Kirkwood again for an "up and back." Though close to the Bay Area, the resort glaringly caters to those staying there, as the amenities needed for "off site" guests, like lockers and parking, clearly aren't there. When I win the lottery, I will stay at Kirkwood. Thank you for reading this post! Disney World awaits and if I can manage, I will write about it! P.S. How did you get that great photo on top?? Love it! Haha! I was just standing there and took it with my phone! That is my lovely shadow spoiling the picture!